The Anvil is one of the most impressive features of a severe storm due to its areal coverage and icy texture. Within a severe storm, moisture is transported from the lower troposphere to deep into the upper troposphere. Not all moisture that is ingested into a storm is precipitated out of the storm. Some of the moisture in a strong updraft is lofted so high into the troposphere that it is not able to drop back down immediately. Strong upper level winds move and fan the moisture out over great distances. The temperature of the anvil is frigid cold. The light density of the moisture allows the wind to move it at will. 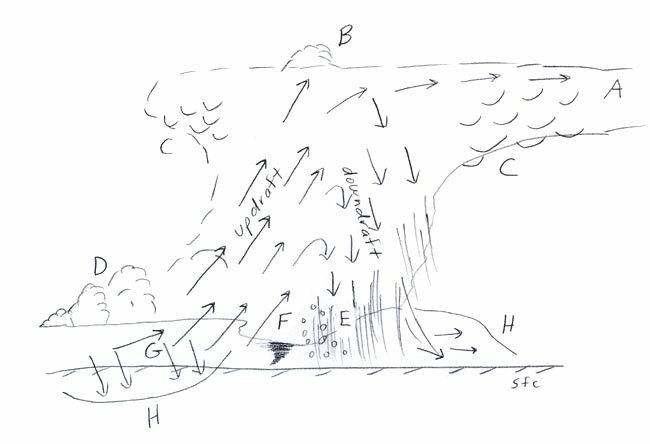 A forecaster can note the direction and speed of the upper level winds by noting the anvil's orientation. The moisture within the anvil will be blown downstream. On the diagram below, "A" denotes the anvil.